A number of years ago, I stumbled across Terra Chips at a grocery store and realized I’d found something BRILLIANT AND WONDERFUL that I couldn’t afford to eat on a regular basis. When we got potatoes, turnips and beets in this past Friday’s veggie box, the first thought that came into my head was: I MUST MAKE MY OWN TERRA CHIPS. At first, dh was totally on board. Then we sorta ran out of time and he was completely against it. Still, I managed to have my way…and it was a good thing I got what I wanted, because these turned out SO NICELY. We also learned, really quite by accident, that we were slightly off in our assessment of the potatoes; turns out they were purple potatoes – a fact we didn’t discover until we put them in the food processor and there was suddenly purple juice in the bowl. Needless to say, purple potato chips >> potato chips. Why? BECAUSE THEY’RE PURPLE. Of course. Now, this recipe does call for the use of a food processor. If you don’t have one, or if you don’t have a slicing blade and can’t acquire one, this can be done with a mandoline or similar slicing tool. I wouldn’t recommend doing the slicing by hand…the equipment is needed to make the slices a relatively even, consistent thickness (in a short amount of time). 2. Wash the potatoes, turnips and beets. Peel the turnips and beets, set aside. 3. Put your slicing blade into a food processor and add the turnips. Pulse until all of the turnips are thinly sliced. 4. Place the turnips into a bowl and toss by hand with 2 tsp of canola oil. 5. Place the turnips onto a large cookie sheet covered with aluminum foil, in a single layer. 6. Repeat steps 3-5 with the potatoes, then the beets. Make sure to rinse the food processor parts immediately following the slicing of the beets, to keep from staining the plastic. 7. This process should probably cover two large cookie sheets (one for the potatoes and one shared by the turnips and beets). 8. Place the cookie sheets into the oven, on separate racks, and bake for about 30 minutes. 9. When the chips are cooked to your desired amount of doneness, remove them from the trays with a spatula and place them in a bowl. Sprinkle a small amount of salt on top and toss to coat lightly. 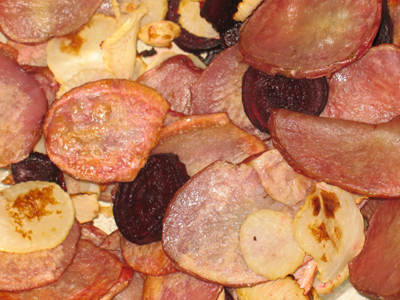 NOTE: the turnips and beets will be a little softer than the potatoes and may not be crisp after 30 minutes. If you want to ensure crispness of the turnips and beets, I recommend slicing them thinner than the potatoes and/or putting the sheet with the turnips and beets into the oven about 5 minutes before the one with the potatoes. This entry was posted in side dishes and tagged cooking, CSA, eat local, locavore, vegan, vegetables, vegetarian by crunchymetromom. Bookmark the permalink. Yum and so happy that you decided to create your own.